This post should have been done a couple days ago, but what can I say, life got in the way a little bit. 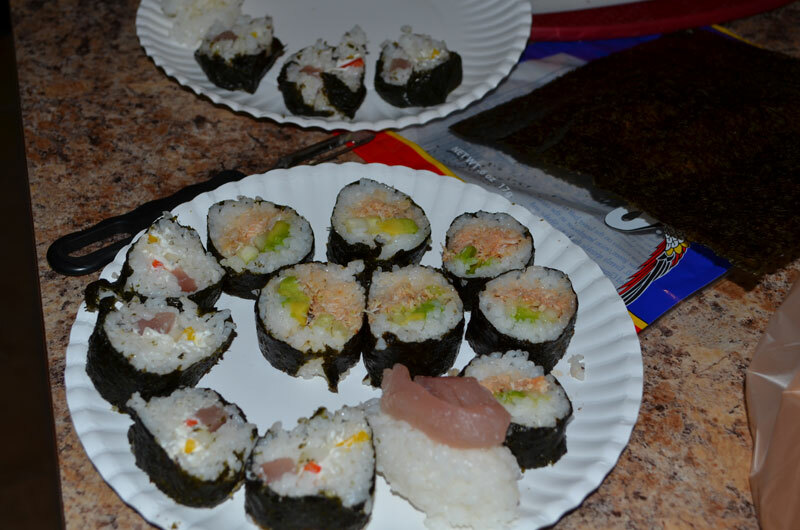 Last week, we made sushi. And when I say “we,” I do mean WE! 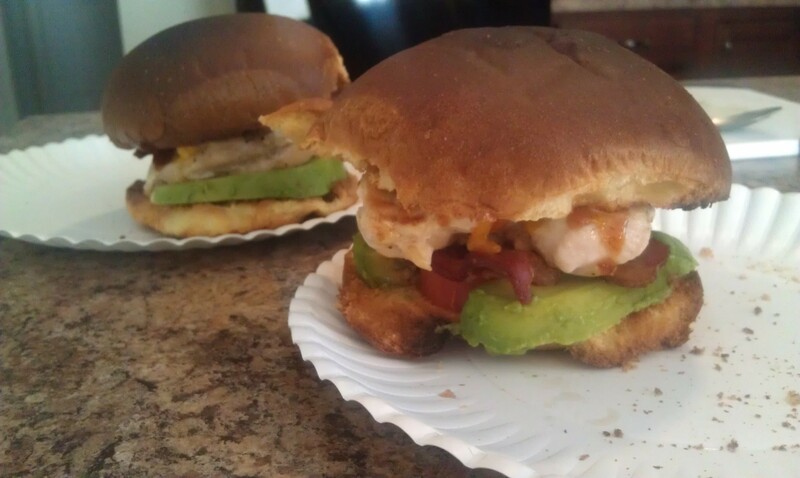 My hunny helped – he even made two rolls by himself! I was very proud! This time around for sushi, we got tuna and crabmeat, and we made a spicy crab with avocado and a cucumber tuna, and then mixed the two together. With some edamame, we were pretty much at our limit with three rolls. It was delicious. Two days later, I made a delicious seared ahi sandwich. The idea came from when I worked at a restaurant in Scottsdale, and they made a very similar sandwich as one of the seasonal menu offerings. 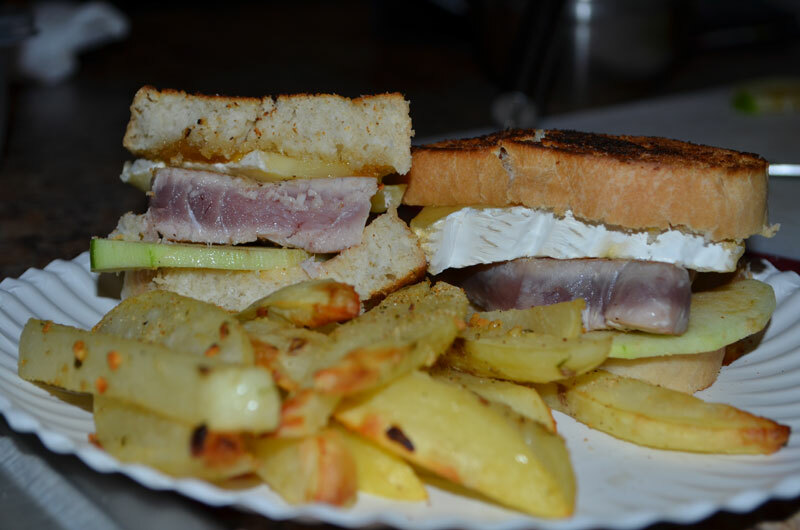 It is addictively good, and when I have fresh tuna on hand, I’d be silly NOT to try to make it! It’s creamy and delicious, with just a little kick and will leave you wanting to lick your plate. What I really like about this, is that I could probably make this a completely local meal. 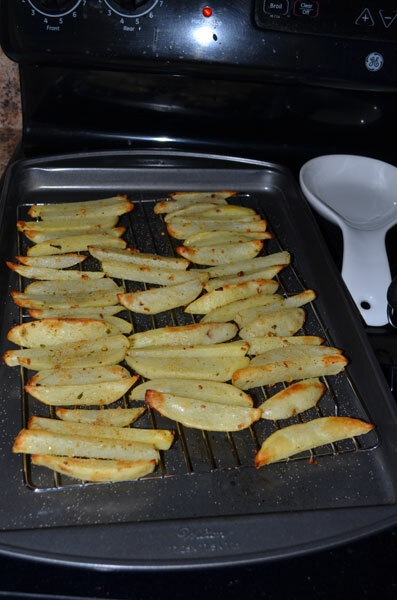 Oh, and on the side, I made the PRETTIEST oven baked fries that were so good. I want to take a second and rave about a little spice shop that I stumbled upon in Key West, Florida. They are called The Spice and Tea Exchange, and they have a whole host of different spices and spice blends, as well as a whole wall of different kinds of salts and teas. I was in hog heaven in this store. I bought a “Pirate’s Bite” blend from them for my buddy who loves spicy food and he adores it, even if it does make him sweat. The spice I used on my fries is a garlic blend from these folks, and I think they are whole-heartedly deserving of some likes on Facebook – they even take orders online. Check them out! Instructions – this is so easy! Make your aioli, to your tastes. It should be a little heavier on the mayo, mustard and hot sauce. You’re going for tangy with a spicy kick. Salt and pepper both sides of your tuna. Preheat a pan on medium high heat, you want to create that delicious sear and not overcook your tuna. While the pan is preheating, toast your bread, just a little bit. You’re going to toast it again at the end. Once your bread is toasted, coat one piece with a thin layer of the jam, and the other piece with a thin layer of aioli. Lay a couple slices of cheese in a single layer on the jam side, and the apple or pear on the aioli side. Sear your tuna. This will only take less than a minute on each side. You don’t want it cooked all the way through, only browned a little bit up the edges. The center will be pink (see the pictures). Once it’s done, put it on your sandwiches and close them up. Now the fun part. Take your closed sandwiches and put them in the pan, for just a couple seconds, starting with the cheese side and then flip. The goal is to melt the brie just a little and toast up the bread some more. Use your best judgement here. Serve with your favorite oven baked fries. Sit. Eat. Enjoy.